Summarize the development of sticky pads for dust monitoring and collect the published literature on the topic. I started with a list of three articles gleaned from Sustainable Aggregates, a UK industry group. Of all the dust monitoring technologies I've seen, computer-scanned pieces of tape are clearly the simplest. they merit some serious investigation. 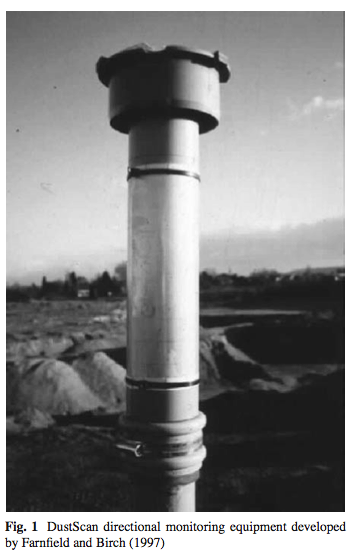 Beaman, A. L. and Kingsbury, R. W. S. M. (1981) "Assessment of Nuisance from Deposited Particles Using a Simple and Inexpensive Measuring System". Clean Air, 11, 1981. The pad is then left exposed for 3-48 hours, Then the 1/4 of the pad with attached backing is removed and the whole sticky pad covered in transparent film or spray enamel. cling film was preferable to automotive spray laquer because no dry time was required, but had to be applied wrinkle free. reflectivity is measured on the difference between the exposed and unexposed parts of the pad. Measurements are then judged against the quantity of complaints by nearby homeowners. The goal being to prevent nuisance dust. I'm missing the primary sources for the intervening 25 years of development because of the rarity of the journal Clean Air. it was discontinued in 1998 and somehow missed the digitization boom of the late 90's early 2000's. The University of Melbourne is fulfilling my ILL request for two articles from that period. Those will be in pt 2 of this note, if significant details are missing from Datson & Birch's summary. Beaman, A. L. and Kingsbury, R. W. S. M. (1984) "Recent Developments in the Method of using Sticky Pads for the Measurement of Particulate Nuisance", Clean Air, 14(2), 1984, pp74 - 81. Farnfield, R.A. and Birch, W.J. 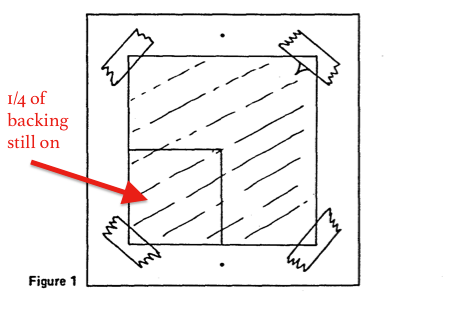 (1997) "Environmental Dust Monitoring Using Computer Scanned Images Obtained from Sticky Pad Poly-directional Dust Gauges", Clean Air, 27, pp73-76. Datson, H. , and Birch, W.J. (2007) "The development of a novel method of directional dust monitoring", Environmental Monitoring & Assessment, 124, pp301-308. Datson and Birch summarize from the '84 Beaman and Kingsbury and from the '97 Farnfield and Birch: The development was to move from pads to cylinders to track dust direction. Farnfield and Birch switched from white to transparent adhesive, and scanned it at 50dpi and develop standards based on % total coverage of the pad. This system was commercialized by DustScan. DustScan developed software that could account for the non-dust things such as insects and seeds to produce more uniform counts. At first, a section of the cylinder was left with the backing on for reference, but they moved to a different system-- The cylinders were manufactured from standard drain pipes and the adhesive held in place with zip ties, and are 300mm long and 70mm in diameter, a 280mm slit was put in the pipe, and both ends of the sticky pad were inserted into the pipe, these sections were used for reference. The cylinders are mounted 2m above the ground for unobstructed flow. The cylinders were then aligned to magnetic north and a rain guard placed on top. Cylindrical dust monitors can produce a 5 degree accuracy in measuring dust direction. protective cans made from more piping are used to store the pads when removed. In Datson, Hall, and Birch's "Validation of a New Method of Directional Air Monitoring," Atmospheric Environment 50 (2012) 1e8 They demonstrate in a wind tunnel that directionality is works, and some other stuff. I haven't read the whole thing yet, but its mostly proof of concept validation. directional dust gauges that capture actual particles that can potentially be identified, all on the cheap and made out of hardware store parts? what's not to love? Thanks for this Mat! Let us know how your scanners testing goes. It might be something interesting for people here in London - air pollution is a big concern but haven't looked into the tools to do testing ourselves. Thanks for sharing the know-how. Directional scanning, eh? I shall have to make a query to a few people I know about that one. We just had an asbestos scare in my neighbourhood - so I wanted to make some cheap and simple collectors that can be hung up by residents in my area, to gather particle matter, and then analysed to airborne asbestos fibres. Did you ever get anywhere with your sticky tape scanning? If so, please let me know. Thanks. the paper is a great substrate! cool exercise.